Knowing our Patients’ Rheumatoid Arthritis "Inside and Out"
“From the inside” means gaining a better understanding of how autoimmune diseases work on a molecular level, and how we can best use emerging scientific information and tools generated by clinical trials and real-world data to study individual patient profiles. In time, it might be possible to use these insights to understand how to pair the right patient with the right treatment at the right time. 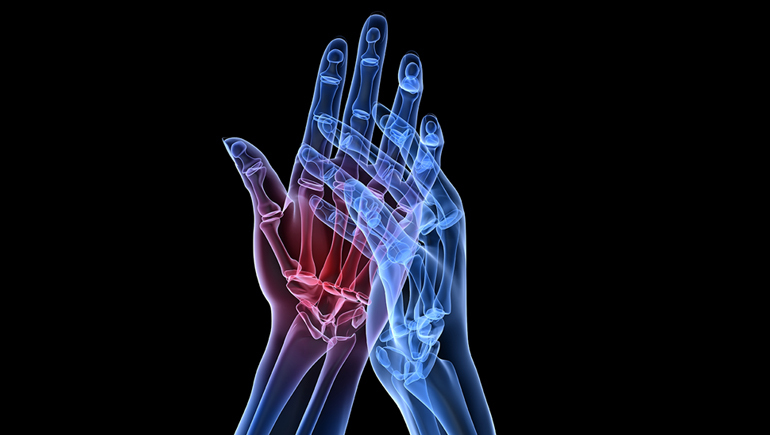 Rheumatoid arthritis is a destructive autoimmune disease causing chronic pain, stiffness and swelling of joints - all hallmarks of the immune system’s inflammatory response, the body’s natural defense against infection and injury. In autoimmune disease, the body’s own immune system mistakenly attacks its own tissues, including the joints, resulting in the destruction of cells and, in many cases, inflammation – or swelling. This process may be driven by the effects of disease-causing, autoantibodies (proteins produced by the immune system that are directed to attack one or more of the person’s own proteins). Left unchecked, there is a constant renewal of these proteins, as well as another type of cell-signaling protein called cytokines. Persistently elevated levels of autoantibodies and cytokines lead to increased disease activity, structural damage and functional impairment. While treatments for rheumatoid arthritis have traditionally focused on targeting the disease’s inflammatory pathways, increasingly, research is pointing to a need to account for the role of autoantibodies in disease progression. One example: some people have a more highly active form of the disease that can lead to worse outcomes if left untreated or under-treated. Research has shown that these people often test positive for a pathogenic biomarker called anti-citrullinated protein antibody, or ACPA, which can be detected in a person’s bloodstream by an Anti-CCP diagnostic test before joint damage becomes clinically apparent. ACPA and other biomarkers are now being harnessed for the diagnosis and prognosis of rheumatoid arthritis, highlighting the importance of understanding a person’s disease profile down to the molecular level. At the Annual European Congress of Rheumatology (EULAR 2018) from June 13-16 in Amsterdam, Bristol-Myers Squibb shared new science exploring the clinical significance of ACPA, particularly as a predictive pathogenic biomarker indicative of a poor prognosis for patients with early highly active, progressive rheumatoid arthritis. We envision a future where pathogenic biomarkers are routinely used as tools for guiding autoimmune disease diagnosis and treatment. The Bristol-Myers Squibb commitment of “working together for patients” means understanding deeply and focusing on the unique needs of patients with autoimmune conditions, both inside and out.